There are 20 species of Armadillos in the world as we know today. Armadillo is Spanish for “little armoured one”. The Nine-banded Armadillo, Dasypus novemcinctus, is the most common, spreading from South America into Kansas in the United States. (National Geographic, 2010) They are most closely related to the Anteater and Sloth, and are said to look like rabbits without its armour. I have always been amazed by the Armadillo’s head to toe hard and leathery armour. It reminds me of a medieval general’s amour, fully plated and ready for war. Unlike many common animals with innate abilities to evade, escape or camouflage themselves when threatened by predators, Armadillos choose to defend itself by utilising its coarse (and awesome) armour in the face of its adversary. Small as a rabbit, brave as a lion, don’t you think so? The armour of the Armadillo is made up of small plates of bones and covered by a later of horny skin. 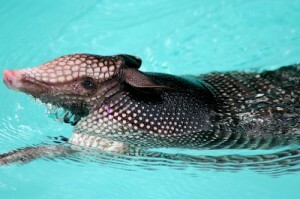 Did you know that Armadillos are good swimmers too? Well, in a fashion, at least. Armadillos can hold their breaths underwater up to a maximum of six minutes! (J Rank, 2010)You can imagine them as armoured submarines, crossing rivers underwater. Their armour is thick and heavy, so they usually sink when they swim. In order to maintain some buoyancy, they inflate their lungs, stomach and intestines with air, which they would if they were crossing a shallow river. Collemen, M. (1994). Determinants of aggression in Nine-banded Armadillos. Journal of Mammalogy , 189. Deep sea anglerfish, Melanocetus Johnsoni, are found in the most inhospitable place on the planet; the cold, dark bottom of the sea. 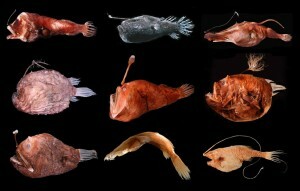 There are over 200 species of Anglerfish, each differing in terms of body structures and size. 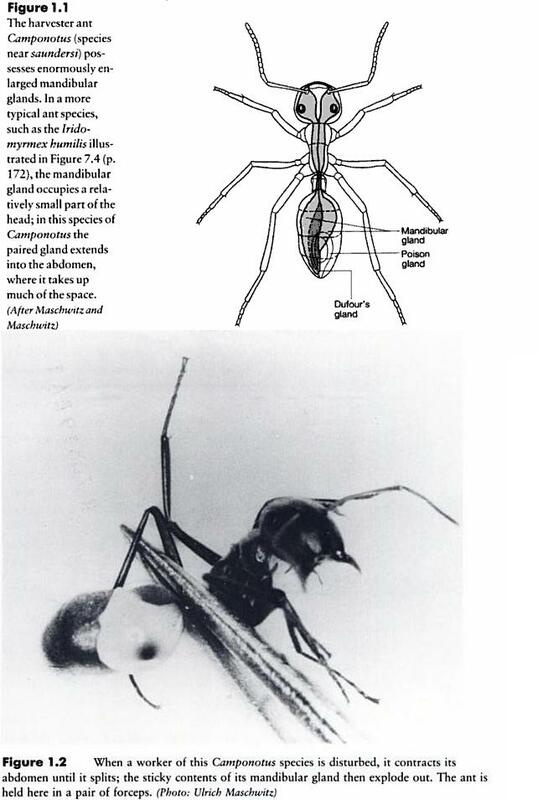 However, their most common and distinctive feature is a slender, antenna-like projection extending from its head or mouth, known as a dorsal spine. The spine supports a light-producing organ called a photophore, which acts like a “fishing-rod” as prey are attracted to the luminescent bubble. However, what is most interesting about deep sea Anglerfish is not just their grotesque appearance and their preying manner, but even more so their mating behavior. The role of males in deep sea Anglerfish is completely reduced. 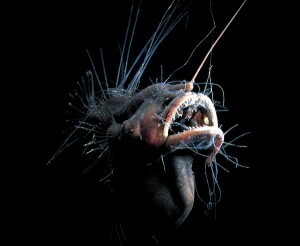 Being barely 1/10th of the size of a female, the male anglerfish live as parasites on females. From the moment of birth, male anglerfishes seem to have no other role than to search out a female. The tiny male has no bioluminescent lure, instead, they have larger eyes presumably for spotting the flashing lure of the female and a greater olfactory organ (organ of smell, or nose) above its eyes. The reasons behind these physical differences between the sexes could be because in the vast ocean, sexual pheromones are highly essential in locating a mate. Thus, in the dark and vast ocean, heightened sensitivity to the female pheromones is crucial in the reproductive lifestyle of the Anglerfishes. 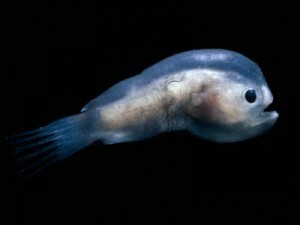 Upon locating a female anglerfish, the puny male attaches itself to her body by biting into her. His teeth and jaw then recedes and a chemical is released which fuses the skin and blood systems of both parties. Thereafter, it becomes entirely dependent on the female for its nutrients and oxygen, similar to that of a parasite. In time, the male anglerfish’s eyes and other digestive organs regresses and its body degenerates into essentially a pair of sperm producing testicles. At this juncture, the female essentially becomes a hermaphrodite, with up to 6 of these male parasites attached to various parts of her body. As a functional hermaphrodite, the female is able to have fertilize her eggs from the moment she releases them from her body. However this is not all, even more intriguing in fact is that the female anglerfish can carry as many as 6 of these parasitic males at one time! thus a single female could have six pairs of testicles at her beck and call, supplying her with a fresh supply of sperms at any point in time! Recent evidence suggests that toads are able to predict earthquakes after researchers observed a mass exodus of toads from a breeding site in L’Aquila, Italy, five days before a major tremor struck. While anecdotes and folklore have linked unusual animal behavior to cataclysmic events like earthquakes since ancient times, hard evidence has been scarce. Furthermore, even those that have been shown to react, such as fish, rodents and snakes tend to do so shortly before an earthquakes strikes, rather than days ahead of the event. Toads are known to remain active in large numbers at breeding sites until spawning has finished. However, 96% of the males abandoned the site 5 days before the quake hits, when spawning had barely begun. The number of toads at the site fell to zero three days before the quake and only started coming back the day after it ended. This highly unusual behaviour prompts researchers to surmise that millions of years of evolution could have given the toads the ability to detect impending quakes, triggering them to flee to higher ground, where they would be at less risk from rock falls, landslides and flooding. 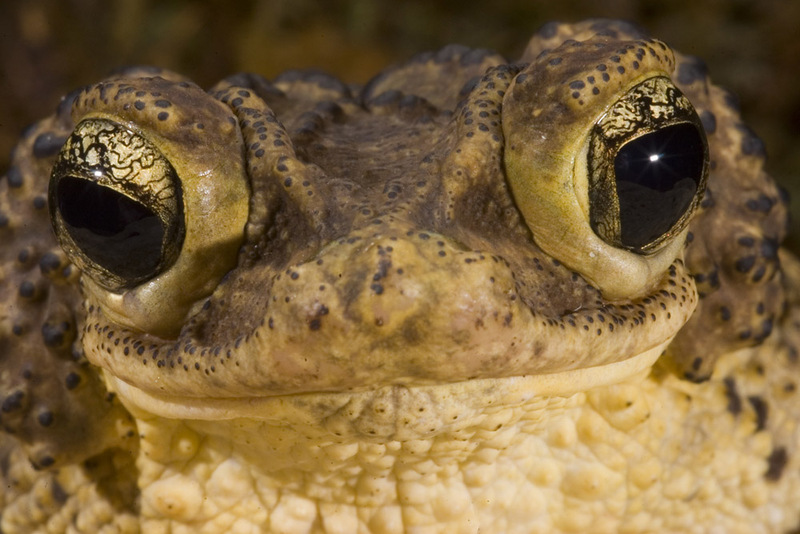 Although the exact method used by the toads remains unclear, findings suggest that toads are able to detect pre-seismic cues such as the release of gases and charged particles, and use these as a form of earthquake early warning system. Hopefully, this will lead to the introduction of a toad-led earthquake early warning system that will prove to be both swift and accurate. Grant’s golden mole, or Eremitalpa granti, is perhaps one of the most adorable animals I have ever come across! From its silky smooth sheen, to its barely-there eyes, down to its cute little snout used for ‘swimming’ their way through the sand – doesn’t this prompt everyone to say, “Awww”! Grant’s golden moles are nocturnal creatures of the desert. These moles often create shallow grooves to the desert sand; because the sand is too fine and loose, the moles are thought to “swim” through the desert surface when travelling or foraging at night. This is why it is sometimes called a sand fish (HowStuffWorks.com, 2008). The reason for such behaviour is thought to arise out of dipping their heads and shoulders into the sand when looking for prey, hence creating the shallow grooves. Observers have associated such head-dipping behaviour with the perception of seismic vibrations made by prey (Matthew J. Mason & Peter M. Narins, 2002). Such behaviour is typical and unique to Grant’s golden moles living in the desert areas. With regards to foraging, it is suggested that these creatures locate their prey (termites, geckos, and some invertebrates) via seismic activity in the sand (Mason & Narins, 2002). The middle ear is thought to be able to pick up signals from within the sand dunes, but this has not been directly examined in studies before. Such behaviour is believed to be an adapted trait that evolved as a means of detecting ground vibrations. It is especially advantageous for golden moles because it makes up for the limited visibility and poor propagation of airborne sounds in the desert, thereby finding preys more efficiently. Matthew J. Mason & Peter M. Narins. (2002). Seismic Sensitivity in the Desert Golden Mole (Eremitalpa granti): A Review. Journal of Comparative Psychology , 158-163. Piper, R. (2007). Extraordinary Animals: An Encyclopedia of Curious and Unusual Animals. Connecticut: Greenwood Publishing Group. “The Golden Mole,” by globalzoo. Youtube Channel, 23 Jun 2009. URL: http://www.youtube.com/watch?v=DV3KkpCkjy4&feature=player_embedded (accessed on 31 Mar 2009).